Urethral prolapse is a circumferential protrusion of the distal urethra through the external urethral meatus. It is a rarely diagnosed condition that occurs most commonly in prepubertal girls and postmenopausal women. Even less common is strangulated urethral prolapse. Vaginal bleeding is the most common presenting symptom of urethral prolapse. Upon examination, round, often doughnut-shaped protrusion mucosa is observed obscuring urethral opening. Because urethral prolapse is rare, the rate of misdiagnosis is high. The differential diagnoses of a urethral mass are broad, ranging from a simple urethral caruncle to rhabdomyosarcoma. Increased physician awareness and early recognition of urethral prolapse avoids unnecessary examinations and patient anxiety. Solingen first described urethral prolapse in 1732. Most authors believe urethral prolapse is restricted to the distal urethra. Various treatments have been used for this type of lesion. In the past, treatment was primarily surgical. Currently, conservative therapy with topical agents is the preferred initial therapy for uncomplicated urethral prolapse. Failure of medical therapy for strangulated urethral prolapse warrants surgical intervention. Many different surgical procedures, ranging from simple manual reduction to complete surgical excision, have been described. Surgical excision has a high cure rate and is the most definitive therapy. Procedures such as cautery, cryotherapy, and ligation of the prolapsed urethra over a Foley catheter are no longer routinely practiced. Urethral prolapse is defined as the complete eversion of the terminal urethra from the external meatus (see image below). Although infrequently reported in the literature, it may in fact be a common disorder among postmenopausal women and prepubertal girls. Urethral prolapse must be distinguished from urethral caruncle, in which only a non-circumferential portion of the urethral mucosa intially protrudes. Urethral prolapse. Note the complete circular eversion of the distal urethral mucosa. Urethral prolapse is relatively uncommon and has a bimodal age distribution. It children, it occurs in prepubertal girls, with an average age at presentation of 4 years. In adults, urethral prolapse most commonly occurs in women after menopause. The English literature reports 270 cases involving children and 46 cases involving adults. The exact cause of urethral prolapse remains unknown; however, several theories have been proposed. These theories may be divided into congenital or acquired factors. Congenital factors include weak pelvic floor structures leading to inadequate genitourinary support and urethral hypermobility. Proposed theories include intrinsic abnormalities of the urethra (eg, an abnormally patulous urethra, a wide urethra, redundant mucosa). Other hypotheses include neuromuscular disorders, urethral malposition, submucosal weakness, or deficient elastic tissue. Acquired factors include trauma during birth, such as prolonged vaginal delivery or obstetric lacerations. Other possibilities include poor tissue quality in debilitated and malnourished individuals. Periurethral bulking agent injection is an unusual cause of urethral prolapse. A popular theory involves a weakened attachment between the inner longitudinal and outer circular-oblique smooth muscle layers of the urethra. Separation of the 2 muscle layers, coincident with episodic increases in intra-abdominal pressure, may predispose to urethral prolapse. In elderly women, poor nutrition and hygiene have been reported as additional possible risk factors. Loss of estrogen at menopause has also been cited as a risk factor. Urethral prolapse in elderly women has become much less common since the introduction of estrogen replacement therapy. Urethral prolapse primarily involves the distal female urethra. The urethra is composed of inner longitudinal and outer circular-oblique smooth muscle layers. Usually, a natural cleavage plane is present between the inner and outer muscle layers. In a healthy female urethra, this cleavage plane firmly adheres to the opposing muscle layers. A prolapsed urethra may result from these 2 muscle layers separating after a sudden episodic increase in intra-abdominal pressure. Disruption of these muscle layers results in complete and circular eversion of the urethral mucosa through the external meatus and leads to urethral prolapse. Swelling and congestion of the prolapsed mucosa create a purse-string effect around the distal urethra, impeding venous return and exacerbating vascular congestion. If left untreated, urethral prolapse may progress to strangulation and eventual necrosis of the protruding tissues. The fundamental anatomical defect of urethral prolapse is the separation of the longitudinal and circular-oblique smooth muscle layers. Surgical apposition of these smooth muscle layers is curative. The two types of urethral prolapse include prepubertal and postmenopausal. Clinical presentation is different for both groups. Prepubertal urethral prolapse is predominantly asymptomatic. Often, urethral prolapse is an incidental finding during routine examination. The most common presentation is vaginal bleeding associated with a periurethral mass. Symptomatic children present with bloody spotting on their underwear or diapers. Hematuria is uncommon. Until urethral prolapse is definitively diagnosed, the presence of blood in the genital area should raise suspicion of sexual abuse and warrant ruling out this possibility. In contrast, patients with postmenopausal urethral prolapse are often symptomatic. Vaginal bleeding associated with voiding symptoms is fairly common. Affected women may report dysuria, urinary frequency or urgency, and nocturia. Either microscopic or gross hematuria may be present. If the urethral prolapse is large, the mucosal mass may become strangulated, which results in venous obstruction, thrombosis, and necrosis of the prolapsed tissue. Patients with strangulated urethral prolapse may present with suprapubic pain, dysuria, hematuria, and urethral bleeding. Attendant urinary tract infection is also possible. Upon physical examination, urethral prolapse appears as a doughnut-shaped mass protruding from the anterior vaginal wall . In children, a pinkish orange congested mass may be observed at the center of the urethral meatus. The mass may be painful and tender to palpation. The mucosa is ulcerated in most cases and usually bleeds upon contact. In adults, urethral prolapse appears as erythematous inflamed mucosa protruding from the urethral meatus (see the image below). The congested mucosa may appear bright red or dark and cyanotic. Depending on the evolution of the process, the prolapsed tissue may appear infected, ulcerated, or necrotic. 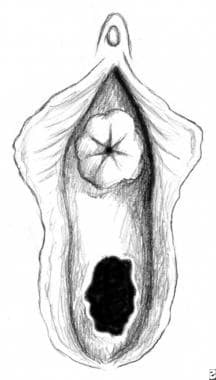 On pelvic examination, urethral prolapse appears as a doughnut-shaped mass protruding from the anterior vaginal wall. Urethral prolapse is diagnosed by verifying that a central opening is present within the prolapsed tissue and that this opening is the urethral meatus. In children, observation during voiding or catheterization of the central opening is diagnostic. In adults, urethral catheterization or cystourethroscopy helps verify the presence of the urethral meatus. The absence of a urethral meatus at the center of the prolapsed mucosa precludes the diagnosis of urethral prolapse. The initial diagnosis of urethral prolapse made by a referring pediatrician or emergency department physician warrants scrutiny because of the rarity of this condition. When evaluating a urethral mass, the differential diagnoses should include urethral or vaginal malignancy, urethral caruncle, ectopic ureterocele,  condyloma, and rhabdomyosarcoma. Routine evaluation with urograms and voiding cystourethrograms is unnecessary except in patients who may have evidence of malignancy, prolapsed ectopic ureterocele, or abnormalities in the ureterovesical junction. If the diagnosis is not completely certain after a detailed history and careful physical examination, the patient should be examined under general anesthesia to rule out more serious lesions. Surgical excision and pathologic examination confirm the diagnosis. Although urethral prolapse does not have pathognomonic features, histological examination often reveals ulcerated polypoid tissue composed of fibrovascular stroma with dilated veins and a few organized thrombi. Mucosal edema, vascular thrombosis, and inflammatory cells may also be present. Strangulated urethral prolapse appears to be more common in the adult population than in the pediatric population. Patients with strangulated urethral prolapse may report suprapubic tenderness and severe pain during urination. Urethral prolapse is often associated with urinary tract infection. The diagnosis of strangulated urethral prolapse is predicated upon the discovery of an extremely painful, cyanotic, circular mass surrounding the external meatus, and this condition requires surgical excision. Surgical excision is justified in young patients with symptomatic urethral prolapse or with recurrent urethral prolapse. Additionally, management of predisposing factors, such as constipation or dysfunctional voiding (causing straining) is warranted. Optimal treatment for postmenopausal women presenting with symptoms of urethral prolapse or strangulated urethral prolapse ranges from long-term topical vaginal estrogen therapy to simple excision followed by a short period of urethral catheterization. Long-term treatment following simple surgical excision would then consist of topical vaginal estrogen cream. The adult female urethra is approximately 4 cm long and extends from the bladder neck to the external meatus. The mucosa of the female urethra is lined by transitional cell epithelium that gradually changes to nonkeratinizing squamous epithelium from the bladder neck to the external urethral meatus. Small periurethral secretory glands line the wall of the urethra to provide lubrication to the urethral mucosa. These periurethral glands converge at the distal urethra as Skene glands and empty through 2 small ducts on either side of the external meatus. The submucosa of the female urethra is composed of a rich vascular network of spongy tissue. It nourishes the urethral epithelium and the underlying mucous glands. Both the mucosa and the submucosa are responsible for providing a part of the female continence mechanism, the mucosal seal. The mucosal epithelium and the submucosal vascular plexus are highly responsive to estrogen. Loss of estrogen at menopause may result in atrophy and loss of the mucosal seal, elmininating an element that protects against urinary incontinence. The female urethra contains 2 layers of smooth muscle: the inner longitudinal layer and the outer circular-oblique layer. The inner longitudinal smooth muscle layer is thicker and continues from the bladder neck to the external meatus. The outer circular-oblique smooth muscle layer encases the longitudinal fibers throughout the length of the urethra. Usually, these 2 layers adhere to each other by means of strong connective tissue. Weakening or separation of these 2 layers leads to complete urethral prolapse. Little sympathetic innervation is found in the female urethra, but parasympathetic cholinergic fibers are found throughout the smooth muscle fibers. Activation of the parasympathetic fibers causes the inner longitudinal smooth muscle of the urethra to contract synchronously with the detrusor. Contraction of the longitudinal fibers shortens and widens the urethra to allow normal urination. Patients in whom topical estrogen vaginal cream use is contraindicated may include women who have survived breast cancer. Consulting with the patient's oncologist and urologist is necessary in such cases. Those in whom surgery is contraindicated include women and children with minimal symptoms who are experiencing urethral prolapse for the first time and those who cannot tolerate a local, regional, or general anesthesia. The prognosis for patients with urethral prolapse is excellent, when treated appropriately. In children, elimination of risk factors, such as constipation and dysfunctional voiding (causing abdominal straining), can help eliminate recurrence. In postmenopausal adults, mild cases often respond well to topical hormone therapy alone. More substantial or emergent cases warranting surgical excision generally recover well with post-procedural catheterization for a short period; subsequently, these patients can remain recurrence free with topical hormone therapy and resoration of the robustness that estrogen maintains in the urogenital tissues. Hall ME, Oyesanya T, Cameron AP. Results of surgical excision of urethral prolapse in symptomatic patients. Neurourol Urodyn. 2017 Feb 21. [Medline]. Mitre A, Nahas W, Gilbert A, et al. Urethral prolapse in girls: familial case. J Urol. 1987 Jan. 137(1):115. [Medline]. Kleinjan JH, Vos P. Strangulated urethral prolapse. Urology. 1996 Apr. 47(4):599-601. [Medline]. Harris RL, Cundiff GW, Coates KW, et al. Urethral prolapse after collagen injection. Am J Obstet Gynecol. 1998 Mar. 178(3):614-5. [Medline]. Surabhi VR, Menias CO, George V, Siegel CL, Prasad SR. Magnetic resonance imaging of female urethral and periurethral disorders. Radiol Clin North Am. 2013 Nov. 51(6):941-53. [Medline]. Anveden-Hertzberg L, Gauderer MW, Elder JS. Urethral prolapse: an often misdiagnosed cause of urogenital bleeding in girls. Pediatr Emerg Care. 1995 Aug. 11(4):212-4. [Medline]. Lai HH, Hurtado EA, Appell RA. Large urethral prolapse formation after calcium hydroxylapatite (Coaptite) injection. Int Urogynecol J Pelvic Floor Dysfunct. 2008 Sep. 19(9):1315-7. [Medline]. Sen I, Onaran M, Tokgoz H, Tan MO, Biri H, Bozkirli I. Prolapse of a simple ureterocele presenting as a vulval mass in a woman. Int J Urol. 2006 Apr. 13(4):447-8. [Medline]. Thosaka A, Yamazaki A, Hirokawa M, Matusita K, Asakura S. [Two cases of urethral leiomyoma]. Hinyokika Kiyo. 1988 Nov. 34 (11):2041-6. [Medline]. Redman JF. Conservative management of urethral prolapse in female children. Urology. 1982 May. 19(5):505-6. [Medline]. Wright M. Urethral prolapse in children--alternative management. S Afr Med J. 1987 Oct 17. 72(8):551-2. [Medline]. Jerkins GR, Verheeck K, Noe HN. Treatment of girls with urethral prolapse. J Urol. 1984 Oct. 132(4):732-3. [Medline]. Holbrook C, Misra D. Surgical management of urethral prolapse in girls: 13 years' experience. BJU Int. 2011 Nov 11. [Medline]. Wei Y, Wu SD, Lin T, He DW, Li XL, Wei GH. Diagnosis and treatment of urethral prolapse in children: 16 years' experience with 89 Chinese girls. Arab J Urol. 2017 Sep. 15 (3):248-253. [Medline]. [Full Text]. Haverkorn RM, Williams BJ, Kubricht WS 3rd, Gomelsky A. Is obesity a risk factor for failure and complications after surgery for incontinence and prolapse in women?. J Urol. 2011 Mar. 185(3):987-92. [Medline]. Knepfler T, Valero E, Triki E, Chilintseva N, Koensgen S, Rohr S. Bariatric surgery improves female pelvic floor disorders. J Visc Surg. 2016 Apr. 153 (2):95-9. [Medline]. Lowe FC, Hill GS, Jeffs RD, Brendler CB. Urethral prolapse in children: insights into etiology and management. J Urol. 1986 Jan. 135(1):100-3. [Medline]. Desai SR, Cohen RC. Urethral prolapse in a premenarchal girl: case report and literature review. Aust N Z J Surg. 1997 Sep. 67(9):660-2. [Medline]. Falandry L. [Urethral prolapse in young black girls. Report of 12 cases]. Prog Urol. 1996 Jun. 6(3):392-7. [Medline]. Fletcher SG, Lemack GE. Benign masses of the female periurethral tissues and anterior vaginal wall. Curr Urol Rep. 2008 Sep. 9(5):389-96. [Medline]. Goh JT, Krause HG, ALIA. Postpartum urethral prolapse. Aust N Z J Obstet Gynaecol. 1998 Nov. 38(4):477-8. [Medline]. Kisanga RE, Aboud MM. Urethral mucosa prolapse in young girls. Cent Afr J Med. 1996 Jan. 42(1):31-3. [Medline]. Rudin JE, Geldt VG, Alecseev EB. Prolapse of urethral mucosa in white female children: experience with 58 cases. J Pediatr Surg. 1997 Mar. 32(3):423-5. [Medline]. Urethral prolapse. Intraoperatively, the prolapsed mucosa is excised in quadrants, and the 2 layers of smooth muscle are apposed together. Urethral prolapse. Postoperative depiction of a normal-appearing urethra after surgical excision.